Traditionally the Campus of Arts has pursued since 2004 both the dream that music should be accessible to everyone. The Solidarity Group of the Employees of the Chamber of Deputies offers every year grants to enable each and everyone to take part in this unique experience of human unfolding through music and art. Grants are allotted by a Jury consisting of the Artistic Director and of representatives of the Solidarity Group. Applicants have to submit their Isee form or equivalent tax declaration. With the project Children’s Athenaeum, the Campus enhances excellence by offering special training support to students enrolled in the “On holiday with your instrument” path that demonstrate a marked attitude and advanced instrumental skills. 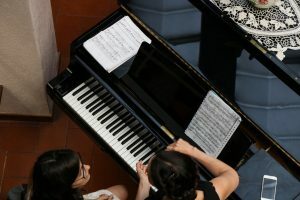 The Campus supports these young students with a professional path: a greater number of instrument hours, participation in the Chamber Music laboratory and another laboratory of their choice, the possibility to access the competition for the awarding of scholarships and concerts. The entry into the Children’s Athenaeum is bound to a hearing, carried out in the first days of the Campus in the presence of the Artistic Director and the reference Professor.